According to Tennyson, in the spring a young man’s fancy lightly turns to thoughts of love; mine, however, turns towards thoughts of salad. I love them all – green salad, Greek salad, Caesar salad, Cobb salad; salads with roasted beetroot, salads with spinach and cous cous and quinoa; Asian salads, potato salads and Middle Eastern salads. I love the simplicity of tossing beautiful fresh ingredients together to make a delicious salad. It’s quick and easy, and as the weather warms up, is the perfect accompaniment to whatever we are having for dinner. It also usually means less time in the kitchen and more time for relaxing in the cool of the evening. 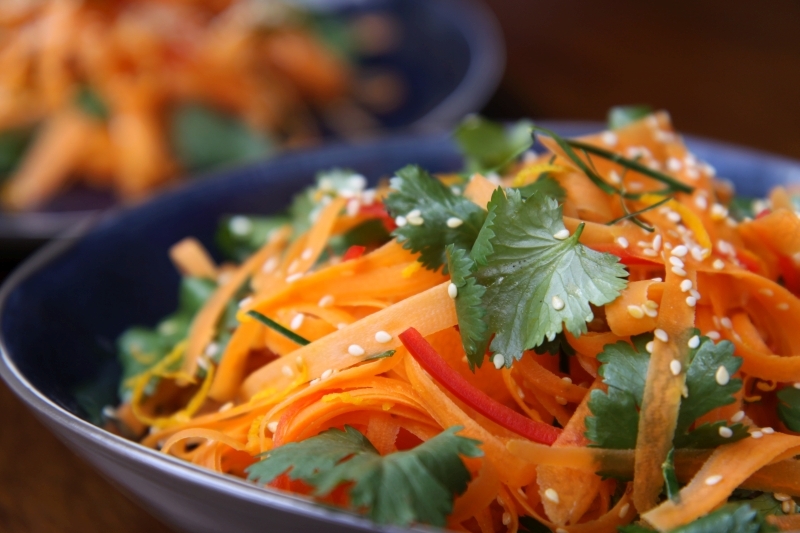 This salad takes the humble carrot and makes it a star, by adding chilli, coriander, lime and sesame, and a tangy citrus dressing. It was a spectacular spring day today, and every mouthful was a pleasure as we ate it for lunch, with the sun shining, a light breeze in the air, and us in short sleeves and bare feet for almost the first time this season. We counted our blessings, grateful to live in such a beautiful place. Use a vegetable peeler to peel long, thin ribbons from the carrots, discarding the core. Slice the chilli in half, remove the seeds and the membrane and then slice into very fine strips. Finely slice the lime leaves. Pick the leaves from the coriander and discard the stems, or save to make a curry paste. 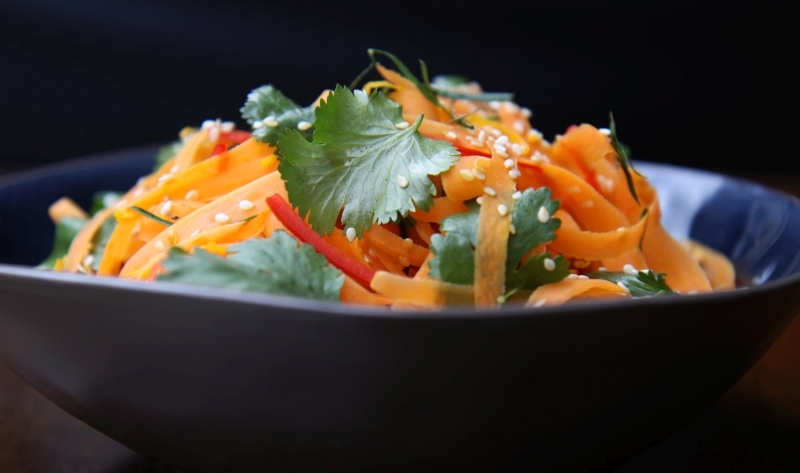 Place the carrots, chilli, lime leaves and coriander into a large bowl. In a small non-stick pan toast the sesame seeds until very lightly golden. Set aside 1 tablespoon of the sesame seeds for the dressing, and add the remainder to the other ingredients. Remove the zest from the orange and add to the salad. Just before serving add half the dressing and toss well. Turn on to a serving plate or bowl, with the remaining dressing on the side. To make the dressing, juice the orange and lemon, add the other ingredients plus the remaining sesame seeds and whisk together until well combined. Season to taste with sea salt and black pepper. I love to cook (and eat). Based in Brisbane, Australia, I write about the food I cook for my friends and family.